What better way to get over your Labor Day/Four Corners Motorcycle Rally/San Juan Brewfest hangover(s) than by hitting up the Durango Coffee Fest this Saturday? 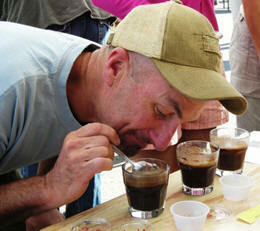 Get your caffeine fix during the ninth annual coffee festival that kicks off bright and early (of course), 8-11:30 a.m. Saturday, Sept. 7, at Eighth Street and Main Avenue in downtown Durango. Sample a variety of coffee beans, teas, drinks, food and other goodies from vendors that include Durango Coffee Company, Durango Joe’s, Crossroads Cafe, Desert Sun Coffee Roasters, Starbucks, Dragon Tea House, Animas Chocolate, Stillwater Foundation and The Durango Herald. The Coffee Festival is a fundraiser for the Durango Education Center, so drink your fill of mochas, macchiatos, cappuccinos, chais and half-caff, no-foam, skinny vanilla lattes to support literacy and education programs for children and adults alike. ← Wetherill Mesa Experience at Mesa Verde – For a limited time only!